Warning: This is a rant about the politics, truths, and lies of Manufacturing Jobs and it’s a long one! I read a blog post this morning by Fred Wilson. Wilson is a very successful, very wealthy venture capitalist in New York. But he’s also wrong, or at the very least mis-informed when it comes to manufacturing. I guess I struck a nerve, because I left a comment about Fred Wilson’s post on the post and it was deleted as spam even though it is clearly a legitimate rebuttal to the discussion. 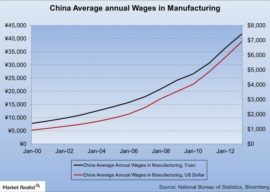 I am bothered by the ongoing discussion about how the US has allowed China (and other lower cost countries) take our manufacturing jobs. That is true, of course. But it does not address the larger context which is that manufacturing is becoming more and more automated and many of these jobs will not exist at all anywhere in a few more decades. But we don’t hear any of our political leaders explaining this. I wish they would. That sort of thing is guaranteed to get me ranting if I come across it in the right (or wrong depending on your perspective) mood. 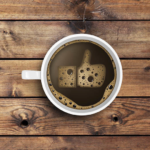 I don’t delve into politics or current events here very much at CNCCookbook, but when there’s a broad and important discussion about our entire industry, I think it’s important to get some perspectives out there from within the industry. 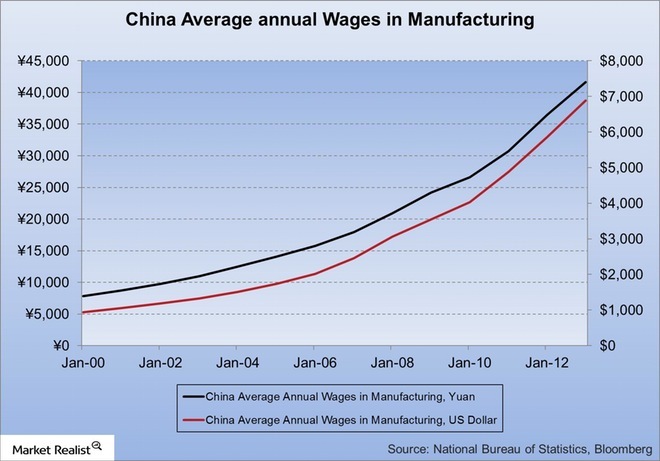 There are some truths in the China Manufacturing discussion, but there are a whole lot more lies (Tweet This). And with all due respect to Wilson, to expect the politicians to tell us the truth is expecting a lot more than we’ve seen in recent history. In fact, I have to take issue with most of what Fred Wilson has to say on this topic. Truths and Lies: What’s the Reality? Those wages amount to a $3.50 hourly rate for a 40 hour a week schedule, while the average US manufacturing wages were $19.50 per hour for the same period. On paper, US wages are much higher, but the reality is that this is a half-truth because there is a lot more to labor costs than just the hourly rate. For example, one could look at productivity. If we compute the cost to get the same amount of work out of the labor force, we get what’s called the “Unit Labor Cost”. Simply put, if you hire someone who is cheap but doesn’t produce as much as a more expensive worker, you may save more money hiring the better worker than the cheap worker. Note how China’s Unit Labor Costs have skyrocketed while the US has actually declined. What this means is that productivity in the US has increased faster than wages while in China the opposite has happened. In fact, China started out relatively even in 2000, and now China costs 3x in terms of Unit Labor Costs than a US worker (Tweet This). 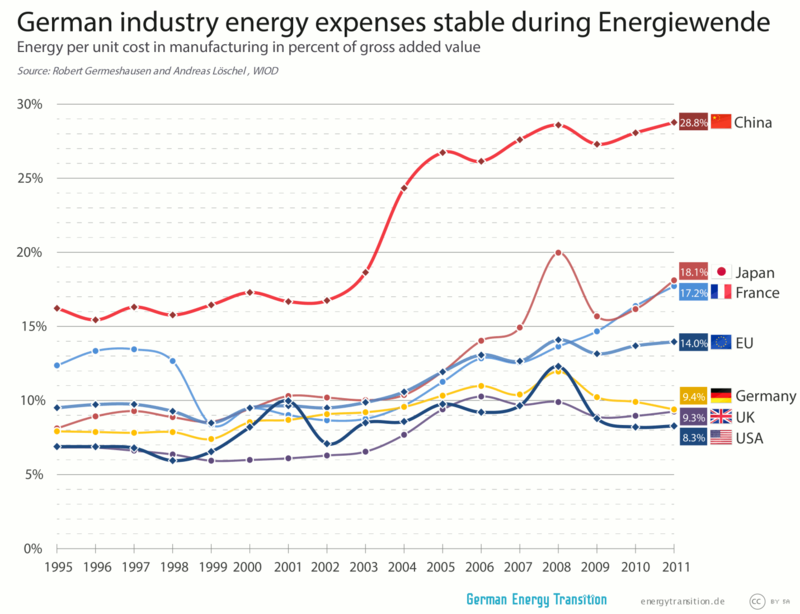 Energy costs in the US are very low and our use of the energy is efficient relative to China. Transportation costs to get the goods back across the ocean. Communication costs when dealing with a shop floor on the other side of the world that speaks a different language and has different customs and standards. The trend is once again an unhappy one for China versus the US. Speaking of energy costs, let’s consider an important truth about Global Warming and China. US manufacturers are about 5X more efficient at limiting carbon dioxide emissions as China. On average, if you spend your $1 on US-made goods, you’re going to save 5X the pollution. At the same time, you’re helping to create jobs in the US. China has done a number of things to manipulate the markets to make it easier for them to take manufacturing jobs. China is a marvel of urban planning, 137-square miles of shining towers, futuristic architecture and pristine parks carved out of the grassland of Inner Mongolia. It is a thoroughly modern city, but for one thing: No one lives there. If they can build hundreds of empty cities, they can certainly subsidize their manufacturing to make it unfairly competitive. After all, it is a communist country that can do all the centralized planning and control it wants. 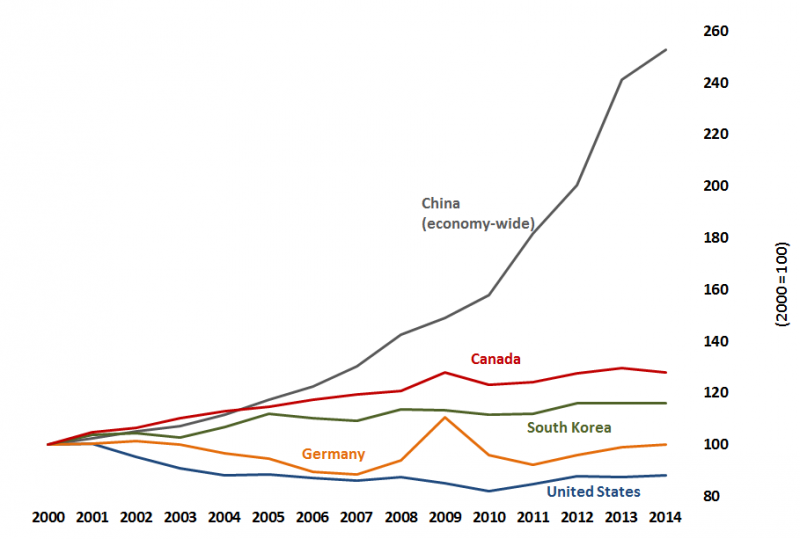 It’s true that China has worked hard to take over manufacturing, but it’s not the whole story. Free Trade is good, and while it may hurt a few, it will benefit the greater good. Let me be perfectly clear–the sum of the GDP’s of the countries participating in the trade may increase due to Free Trade. But some of the participant’s GDP’s may decrease. Free Trade that helps the World but hurts the US has helped give away our Manufacturing Jobs. In fact, the elite case for ever-freer trade, the one that the public hears, is largely a scam. That’s true even if you exclude the most egregious nonsense, like Mitt Romney’s claim that protectionism causes recessions. What you hear, all too often, are claims that trade is an engine of job creation, that trade agreements will have big payoffs in terms of economic growth and that they are good for everyone. Yet what the models of international trade used by real experts say is that, in general, agreements that lead to more trade neither create nor destroy jobs; that they usually make countries more efficient and richer, but that the numbers aren’t huge; and that they can easily producelosers as well as winners. This drive for Free Trade has helped us to give away our Manufacturing Jobs largely to help the leaders of Big Companies and their Investors. But it’s been devastating to the Man on the Street looking for work in Manufacturing. There can be little doubt that automation has eliminated a lot of jobs from manufacturing. By the way, almost any advancement in productivity will tend to eliminate jobs. The shift from HSS tooling to carbide tooling meant that fewer workers could produce the same number of parts. Reality: The Robots Didn’t Take All Our Jobs. They May Not Have Even Taken Many of the Jobs. People like Andrew McAfee have made careers out of predicting that machines will eliminate virtually all jobs, and that this is inevitable. People like Fred Wilson take this sort of thing as Gospel because they move in the orbit of people like McAfee. As Venture Capitalists, they want to be keenly aware of which Megatrends can be ridden, and which ones may squash potential businesses they choose to invest in. Always beware the argument that consists largely of projecting that some graph will continue just as it always has. The world is littered with people who believed that and found out that they were wrong. We can quantify the impact of automation in many ways. 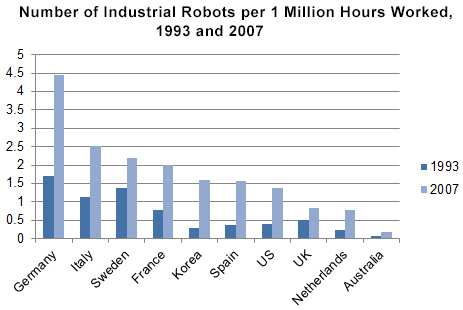 Between 1993 and 2007 robots accounted for 10% of total GDP growth and 16% of labor productivity growth in manufacturing. Even if we choose to view that impact as being totally negative on the number of jobs, how can a 16% increase in productivity be responsible for destroying an entire market segment of jobs? The answer is that the Robots didn’t take all our jobs. They may not have even taken many of them. BTW, the same article concludes that automation has had a similar impact to the Steam Engine, which was generally thought to be part of the Industrial Revolution that created a huge number of new Manufacturing Jobs. It’s pretty clear that the predicted losses are often much higher than the actual losses, though there are exceptions. The point is, the primary cause for the loss of these jobs is not robots and the dystopian future where there is no work because there are too many robots is long ways away. Truth: Even With Substantially More Automation, There’s Plenty of Manufacturing Jobs Available. 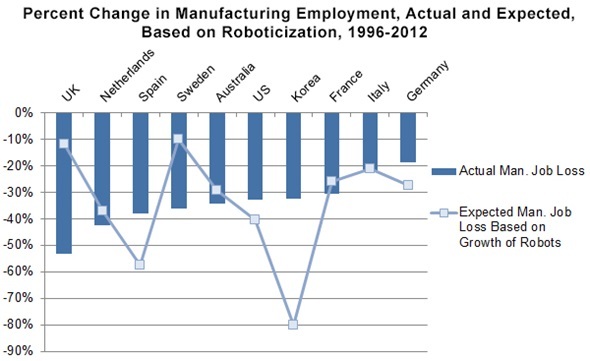 The figures above suggests that automation reduces the need for jobs by less than 20%. Let’s be extremely generous to the Robots. Let’s assume it reduces the need for jobs by half. Are there enough Manufacturing Jobs left to make it worth caring about this sector? It isn’t going to take me very long to make the point. Foxconn employs 300,000 workers just to manufacture Apple’s iPhone 5s. If we cut that in half due to Automation, we could have 150,000 Manufacturing Jobs created here in the US–and that’s just for one product out of the tens of thousands US companies are manufacturing overseas. Heck, we can divide the numbers by 10x and still have a meaningful and valuable number of jobs created if we focus on rebuilding Manufacturing in the US. Speaking of Apple, if you’re going to tell a lie, it may as well be a whopper, I suppose. Apple trotted this one out as they were being pressed on why they sent so much manufacturing overseas. It’s an, “Even if we wanted to, we couldn’t because we can’t find enough talent to get it done.” Their claim is that there aren’t enough skilled workers to do much manufacturing in the US, and that’s why they have to do it in China. All the remaining American tool-and-die makers–a key profession in preparing to make high volume products–could hardly fill the auditorium in Rancho Palos Verdes where the event was held, Cook said. In China, those skilled in that trade would fill several cities, he added. Mr Cook, I don’t know how large your auditorium was, but the world’s largest indoor stadium seats 50,000 while the Bureau of Labor Statistics claims there are some 74,000 Tool and Die Makers in the US as of their 2015 numbers. Talk about telling whoppers. If there aren’t enough of these people, it’s hard to understand how we have the most amazing Aerospace, Defense, and Oil and Gas Manufacturing Industries in the World. Something tells me that people capable of building Stealth Fighters can manage to make iPhones too. Apple is starting to see a tiny glimmer of light, building small manufacturing facilities here and there, but these are a drop in the bucket. I hope by now you see why I’ve gone on ranting this way–most of the conventional wisdom about Manufacturing Jobs and Offshoring is wrong. We can have a healthy, vibrant, and growing Manufacturing Sector–perhaps now more than ever since many of the factors that put us here are in decline. Doing so would create many welcome jobs in an economy that still is not really recovered from the Great Recession. We know we should, even the politicians are talking about it a bit, but how can we accelerate the Manufacturing Sector? We don’t need an all-out trade war, but a little bit of protectionism can go a long way. We need to get smarter about rolling back some of the Free Trade in ways that will accelerate job creation in the Manufacturing Sector. Most importantly, we should penalize those who compete unfairly with us–they’re not good trading partners. We should start with China. Small businesses create most of the jobs in our economy, and particularly new businesses. Anything we can do to make their job easier is going to help everyone. Small businesses pay a disproportionate amount of the penalties our Government imposes on every business. Let’s take one example–Sarbanes Oxley. Many of you may not have heard of it. This was legislation created in the wake of Enron to prevent future Enron’s. Mostly what it does is to make it much harder for a company to go public on the stock market. Companies today have to be much larger before they can go public. 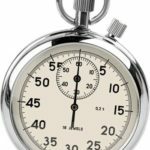 How can this matter for Small Business? For starters, the likelihood a business can go public down the line will affect it’s ability to raise capital along the way. If you don’t think Manufacturing Companies can go public, have a look at Proto Labs which is doing very well. It’s really nothing more than a very fancy Job Shop when you look under the covers. We live in a Manufacturing Technology Renaissance from many perspectives. Innovation takes capital and yet it’s very hard to come by for the Manufacturing Sector. Or consider programs like Obamacare that add cost to every worker. Those that thinks this can’t possibly affect employment because it affects every company are just flat out wrong. The cost has to come out somewhere, particularly when you must compete globally. The annual cost of regulations on businesses overall is about $8,088 per employee. The cost of regulations on small businesses (those with fewer than 20 employees) is $10,585–a significantly higher drag on their competitiveness and ability to create more jobs. This information is from the US government’s Small Business Administration. Why would we penalize the principal jobs growth driver? If you ever tried to apply for an SBA Loan, you’ll know it is a political pork barrel cunningly designed to favor only those voters who the politicians in control want to favor. Why not create a special program to help Small Manufacturing Businesses gain access to capital? Given how much more efficient these kinds of businesses are at creating jobs, and how much more efficient they are at putting capital to work, a program like this would pay for itself in no time. The rate at which we can add skilled labor to the pool of talent will ultimate govern our ability to grow the Manufacturing Sector. We hear politicians like Bernie Sanders talk about making education completely free. This is a plan that some estimate will cost state and Federal government some $70 Billion a year–probably too much to afford. But what if we made Community College programs relevant to Manufacturing Jobs free or nearly free? That would cost a LOT less and would rapidly add more skilled labor to the workforce. That’s a plan worth looking into. We’ve seen that China was not alone in plundering our Manufacturing Jobs. Big Companies and those that benefit from them (their executives, owners, and shareholders) helped. We’ve also seen that Small Business pays a disproportionate share in many ways. They don’t get to offshore their jobs. They pay more in regulatory expenses per employee. Their access to capital is much scarcer. We love to favor the Big Companies. We’re proud as a Nation when we can point to companies like Apple or General Motors. But the truth is, we need to be proud of our Small Businesses because they’re really who built this country. We have a progressive income tax, so why aren’t we making corporate taxes progressive? In particular, why not make Big Co’s pay a disproportionate share of things like Obamacare? What if they had to pay the entire Small Business Obamacare burden? Moreover, what if we let them offset that burden based on how many jobs they create in the US rather than overseas? We’d see change in a hurry, that’s what. And couldn’t we use a faster rate of change? I’d like to hear what you think in the comments. How Does Germany Stimulate Its Manufacturing Economy? They have been ripping off my products for years now!!! I refuse to ship to China, even if the buyer is a good person, I just can’t do it anymore. Thank You for your good thoughts. One can have the best CNC equipment and software but without an understanding of economics and world business, one may not be able to make any profit from their equipment. I humbly offer my general conclusions from my study of economics and business. The solution to the problems of Capitalism is not Communism. The solution to the problems of Capitalism is to support the growth of Free Enterprise. Capitalism is not Free Enterprise. Once a business is granted a concession to be free of various liabilities, it is no longer operating freely in the market. Legal Liability is just as important on the balance sheet as capital liability and assets. A corporation being granted Free Speech and money being legally considered Free Speech further removes a corporation from the concept of Free Enterprise as it allows a corporation to petition the Government to pass laws that give it market advantages. China did not steal our manufacturing. Corporate CEOs gave it to them. Germany did not steal many of our manufacturing facilities, they were sold for short term profit. 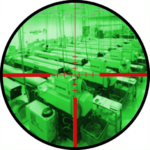 Research the companies of your machine tools and abrasives and see who actually owns that company and where the profits go. Smart German companies that understand long term value. Manufacturing, an enterprising activity, takes raw materials, resources and intellectual exertion and creates wealth. Wealth powers a nation. An entity that tries to profit from the wealth created by an enterprising activity without returning any value to those outside of the shareholders is a parasite of a nations wealth. Slavery was a Human Capital market. Socially unaccountable, short sighted, and intellectually lazy corporations are still chasing the bottom line in Human Capital. The one evil thing any nation can do is to set abusively low standards for its workers that do not allow them a good living wage. Corporate stupidity, short shortsightedness and intellectual laziness is not illegal. Share holders can vote for a responsible board and CEO but that check and balance is so far removed from a shareholders responsibility and those that do vote most likely vote for short term gains. Nikita Khrushchev never got to sell the rope to the Capitalists to hang themselves. They put it around their neck themselves and are currently selling the ground out from under themselves to finish the hanging process. … Literally; Much land here in Northern New York and most New York State hydro electric rights are owned by smart foreign corporations. Reasonable Finance is needed for some situations. For Centuries, India shunned usury, supposedly was never able to develop infrastructure and ended up being ruled by other powers. The balance may be with some form micro financing. China has sold me enough inexpensive high tech equipment where I can personally afford to own my own means of production. This just throws a wrench into Marxism vs. Capitalism debate. Nature does not honor ideologies, there is only that which survives. China rethought Communism and is surviving well enough. The US needs to rethink Capitalism if it wants to survive. Thanks for reading through all this. Gotta’ get back to turning the wheels for my means of production. For the small business trying to be competitive in a market of giants that can afford the shipping container volumes ( we can’t ), that $3,000 CNC machine that is available thanks to the Chinese paying attention to our growing Maker market allows us get our parts at all, let alone much cheaper. By bringing the manufacturing in house, it also allows us to expand the skill sets of our employees into areas that we had not intended but represent an investment in them and our company. It also enriches all of the support providers that benefit from that growing DIY/Maker/Business community not the least of whom is Bob Warfield himself. And, in the end, might actually encourage the growth of a new generation of machinists that are a hybrid of designer, programmer and engineer that is just the ticket to whip cheap labor and return us to the “Citizen Scientist/Entrepreneur” that made this country great. I’ve been encouraging (read begging) CNC manufacturers in the US to come up with smaller machines for over 20 years and they never “got it” until they saw the Chinese doing it. The good news is that some brilliant minds (Tormach and Axiom for instance) have decided to take the communications bull by the horns and have custom products produced in China to their spec and rigorous control inspected on site at the factory, so we don’t have to run that gauntlet ourselves. I’m more than happy to pay a reasonable price for their valiant efforts. great post. i fished your comment out of spam and it is now in the comment thread. Thank you, Fred. I believe Manufacturing is an important and vital part of our economy that we should be growing. That may be self-serving given my company is associated with that sector, but I think it is also true for America in general. Thanks for a nice read that I can point people to when this topic comes up, as it does over and over again these days. In my mind, unhinging health care from business is one of the biggest issues to business, especially in the manufacturing sector. Right now companies in the US have a 17% cost that they bear on all their production directly associated with the US business model of covering health care via employment. NONE of our competitors have such a cost associated with their products, only the US. That HAS to change in order to free up our manufacturing productivity. It seems to me that there is only one candidate for President that touches on the change in direction we need based on your assertions. Perhaps it’s a bit non intuitive but out of all of them, only Bernie Sanders hits the majority of your points. Health care needs removed from employers, forcing lending institutions to actually lend, raising the level of accessible higher level education, revamping trade deals to protect and bring back jobs, and revising upper income taxation via increases in large capital gains and income taxes. So rather than blowing Sanders off as a socialist, take a moment to consider how your business would operate with his policies in place. The only way we’ll get there is through big changes. Tinkering at the edges hasn’t worked. John, I wouldn’t bet much money that Sanders will be a friend of manufacturing. What I would do is as I suggest in the article, make the Big Companies exporting the jobs pay for the small company’s health insurance. That would be a much bigger leveler when you consider Bernie will wind up raising corporate taxes on everyone like crazy and Big Business still shelters most of their income offshore. Well, we can disagree then. I strongly feel that employers should have NOTHING to do with health care so they can fairly compete with competitors in other countries which have nothing to do with health care. Not only is business in the US strapped with health care, they are strapped with the most expensive health care in the world, by a factor of 2. Global trade pretty much demands that we stop saddling business with such a big albatross. John, it’s okay to agree to disagree, but there are some important nuances. For example, Employers pay for part of healthcare in Germany, which is quite competitive in manufacturing. Also, when we talk about being Globally competitive in manufacturing, we have to be very careful about what we mean. Right now, we manufacture so many goods for consumption in the US overseas that we don’t have to be globally competitive at all–we just have to quit exporting jobs to make goods for consumption in the US. Lastly, based on the data I’ve assembled above, it’s far from clear that we must quit having business pay for healthcare in order to be competitive even if we do want to compete overseas. It doesn’t really matter what line items competing countries pay for or don’t what matters it the overall cost to manufacture a product. We’re quite competitive on that today and will become moreso over time as the trends are aligned in our favor (wages continue rising overseas, we keep our energy costs down, we do well with automation, etc.). Yep, I agree with what you state. I guess I’m more focused on continental competition, like from Canada. In woodworking there is a lot of competition from Canada to the US. Just my little world I guess. BTW, the Bernie plan does keep employers on the hook for 6.5% of health care, as a tax, independent of whether your employees have health care or not. Frankly we can both agree that it isn’t likely to matter the way sausage is made and all. But IMO we really have to divorce business from health care and when we do employers, citizens, and health care itself will be all the better for it. It’s interesting to see how much health care professionals hate insurance companies. Not an industrial state so a limited talent pool. You want to hire a machinist but the power plant, military base and other government entities out compete you (small businesses) by offering better wages and benefits. Gotta woo kids away from McDs… Same goes for welders in this hypothetical town. It’s tough to offer a better deal than the government. 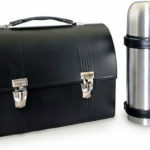 Education has decided that teaching the trades is not cool and or is too hazardous and makes them liable to litigation. Parents are not interested either so it becomes the perfect storm to close down the trade classes. Students graduate without any exposure to working with their hands. Maybe a few in (stem) robotics classes. Maybe this scenario is not too common but it sure gives us grief here. I just retired from working 40 years in the electronics manufacturing industry, all of it in Florida; most of it as a design engineer. I’m fond of saying the only thing that didn’t change in 40 years was the constant sound of pundits saying “we don’t manufacture anything in this country anymore”. So when Apple said they couldn’t build the iPhone in this country I couldn’t help but laugh – and then face palm. The engineering magazines are brimming with stories of “onshoring”; how jobs that were outsourced to the orient are coming back because the economics just haven’t worked out the way everyone thought. A large part of it is the rising labor costs and unit labor cost you talk about. But while much of what you say seems right on, some of it leaves me wondering “why”? Several comments up above go back and forth about various ways to fund health care, and the problems that causes for small business. Nobody took the view of the free market! Why not? We buy car insurance, fire insurance, home insurance, and any other kinds we want all by ourselves. Why should health insurance be the only one that’s so complicated a group of HR department “experts” pick it for us? Why shouldn’t I be allowed to buy coverages I want, from the company I want, even if it’s in another state? Under the ACA, I’m required to buy coverage for pregnancy, alcoholism, drug addiction and more. I’m an over 60 male, don’t drink, never touch anything that isn’t prescription – and am careful with those. The chances of me needing any of those coverages is 0.0. It’s fund raising to try to make “one size fits all” programs. When is “one size fits all” ever the best solution? And business taxes? Seriously? We have the worst business taxes in the world, and they’re one of the things that make us less competitive. Business don’t pay taxes; they collect them (and the cost to collect them) from their customers. Do you just want to punish big companies? As for the free trade agreements, I’d say the jury is out on that. Krugman is also an advocate that all the big improvements in the world that led to the high annual GDP growth of most of the 20th century is over, and that the world is going into a period of slow to no growth. Instead of 2 to 3% per year GDP growth, expect 0.2 or 0.3%. In other words, everything has been already been invented. You know how in 1900 pundits said they should shut the patent office because everything had been invented? That’s Krugman today. Not saying anyone can’t be right on one and wrong on the other, but I think it’s more complex than just “free trade bad”. Finally, Mike Rowe (the “Dirty Jobs” guy) has been pushing trades and skilled labor hard. Pretty much the only voice I see. Local electricians here in central Florida are having such a hard time finding workers, they pay kids to go to get an associates degree and become an apprentice. Meanwhile, the self-appointed experts who tell high school kids what good jobs there are to train for tell them only about office jobs. Obviously, I have nothing against engineering, but the same article I saw had various engineering disciplines in the top 10, with welders and tool and die makers rated in the last 10 – out of 110. Sad fact of life is that people vote with their wallets, this means that they will largely choose the cheapest option, no matter where or how it may be produced. They know about the buy smart, buy once mantra of buying quality and that quality comes with a level of additional cost, but until the item becomes a sufficiently important part of what they do, cheap and cheerful is good enough. Having different levels of duty/tax on an item can make a difference but not necessarily that much. Here in the UK, there is no import duty on items bought from Europe, about 2% for goods from China and about 10% on goods purchased from the USA. The quality items are made in the UK, Germany, USA, etc, yet the public still mainly buy the Chinese made item simply because it’s cheaper. Buying from ‘the bay’ skews sales towards China even more when for many smaller electronics items the vendors are prepared to sell at a significant loss, with free shipping, simply to boost their feedback ratings, many smaller local firms cannot compete with that level of marketing. Taxing/adding duty a particular item will not necessarily stop people buying it – take cigarettes as an example, currently nearly £10.00 for a pack of 20 over here, where around 75% of that price is duty or tax, there are still plenty of people buying them, on the flip side that 75% pays for our National Health service. Make something socially unacceptable and it will have more impact – battery egg farming, once the main method of producing cheap eggs, is now unpopular with the public and more expensive free range options are the norm, and the higher prices are accepted by the buying public. Making smoking socially unacceptable, whilst it has reduced the number of smokers, has had little impact on the tobacco companies, they simply diversify and sell nicotine patches, etc, to those trying to quit and sell high tar cigarettes to third world countries where it is not yet prevented from selling/advertising. Copies are always going to happen regardless of patents, trademarks, etc – China does not recognise patents and will copy the item anyway and then undercut you by mass producing and flooding the market. Is this really that different to the aggressive tactics of the likes of Walmart setting up outside of a town, undercutting all of the local shops to put them out of business and then raising its prices again once they have cornered the market? China has yet to raise their prices, but they are fast cornering the market. Not too many solutions, but all food for thought. Interesting to see genuine concern in the USA about the Corporate Benefit Plans AKA free trade deals. New Zealand has just signed a free trade deal, the Trans Pacific Partnership (TPP), with a number of countries, including the USA. Considerable concern has been expressed by New Zealanders that we will get little benefit. Whatever the agreement Wisconsin dairy farmers are unlikely to allow significant NZ dairy imports – see Bob’s reference to tarrifs. Still I suppose what else could we expect with a Prime Minister who made his fortune as a financial trading supervisor working for Merrill Lynch. This is an interesting article on the economics of manufacturing with several good points, however I would like to share my views on some of the points you make. I am one of those aforementioned economists, I am also a small business owner and CNC’er. Often I see people use economic theories and concepts in a misrepresented way, usually subtly skewed to support the political argument they are attempting to make. In the article you talk about the idea that “free trade is a tide that lifts all ships”. This concept has its origin in the Hecksher-Olin Model of free trade, and it is very often used as an argument for or against the results of free trade. The core economic premise is that free trade allows countries to consume beyond their own production possibilities frontier (yawn), what it means in real words is that the total consumption of the two countries can be greater, thus making the aggregate population better off. An almost certain downside is that those who specialize in the industries for which the countries’ have a disadvantage in production are made worse off. The ‘understanding’ is that the benefit received by everyone outweighs the loss of the others. I’m glad to see that you have mentioned this, usually it is conveniently left out for the sake of attempting to make a stronger argument. From a purely economic standpoint, from which maximizing the utility of the market is the goal, it seems the more free the trade the better. However, as with most economic theories, the concept is markedly different to the real practice. Things like artificial currency manipulation and forced government specialization cause the results to not be so perfect. I’m very glad to see you talk about the unit labor cost. People are so quick to use lower wages as ‘proof’ of their stubbornly unyielding views (whatever their views may be) of why outsourcing occurs that they almost never look at the whole picture of what employees mean for an economy. It is never as simple as: “China employee: $3 per hour, US employee: $20 per hour. That settles it we’re moving to China!” How much an employee is worth, in terms of productivity, is just as important as how much that employee is paid. By the same token the return on investment of employees isn’t nearly as straightforward as people might think. In your article you talk about the common notion of automation replacing employees. In economics the terms used are different, but broadly mean the same; capital and labor, respectively. The common argument is that machines replace workers, in economics terms they are substitutes. But in reality labor and capital both can substitute AND compliment each other. An excess of either proves to be inefficient. In real terms let’s use a machine shop as an example: Say the shop makes aluminum doodads and widgets. They hire 10 machinists and purchase five mills. At any given time perhaps half of the machinists are idle and the others are attending to the machines, the shop is very inefficient. The polar opposite: the shop purchases 10 mills and hires five machinists. At any given time say half of the machines are sitting idle while the machinists attend to the other machines. Now say the perfect efficiency is achieved: the shop hires five machinists and purchases five mills. Both the employees and the machines can achieve as close to 100% productivity as possible, neither is ever sitting idle. Obviously this is a highly simplified example, but it demonstrates the core concept in economics that labor and capital are compliments to each other, in addition to being substitutes. It is not as simple as a company purchases one VMC, so they can fire one worker. What about the skilled workers needed to produce and design the machine? The ones needed to program and maintain the machine? The market now requires more highly-skilled and educated workers, which feeds right into your points about providing education. Although nothing is ever free. I take some issue with the common notion that big companies should be forced to pay far more than small companies. This may seem strange given that I own a small company, but I believe it very strongly. I do believe that taxes should be based on income, but too often it seems like people lambaste large corporations for being greedy entities that need to be punished (usually with taxes) for their transgressions. Certainly there are many amoral actors in large business, as there are in small business, and they should be held accountable. But economic fairness should be about bringing the low up, not the high down. Who doesn’t dream of having their small company grow into a world-class titan? As a small business owner I know how hard it is to get capital, and as you say in the article providing ease of entry is important. But I am surprised that you don’t also mention the massive corporate tax issue. Business is about profitability and the cost of production is only one aspect of how profitable the company can be. Companies move production to China because they expect it will make them more competitive; it will lower their cost of goods sold. I believe it is very reasonable to assume that companies would be less quick to outsource overseas if given globally competitive tax rates. The US has very high corporate tax rates, as a result companies do whatever they can to remain profitable, including outsourcing and even moving their headquarters overseas. Companies shouldn’t be forced to stay in the US or forced to pay unreasonably more than others based on size. These sorts of policies only serve to dissuade companies from growing, and give already large companies even more incentives to leave. Companies should WANT to stay in the US because it’s the best place to run their businesses. They should stay because the US is an incubator for great ideas, a world-leading place for history making things. Not a prison where they are held captive for their tax revenue.